SoundGear by Starkey Hearing Technologies provides a no-compromise combination of both situational awareness and hearing protection. Whether you are in the woods, at the shooting range, on the battlefield, the factory floor, or the construction job site, you need both the ability to hear what is going on around you and protection from the constant and/or intermittent noises that can cause permanent hearing damage and tinnitus. SoundGear electronic shooting and industrial ear plugs provide the solution to the dual challenges of hearing enhancement and hearing protection, and without the need to compromise on either requirement. All SoundGear models are built on the world famous Starkey hearing aid platforms and feature advanced pre-programmed digital technology that provides as much as 15 dB of gain so you can hear ambient sounds better with SoundGear in place than you can with the open ear. At the same time, SoundGear protects your hearing by compressing the ambient soundscape to a safe volume level, letting you hear everything that you would with the open ear, but at a safe volume level. What this means in practice is that you no longer have to compromise your ability to hear danger signals and voices in noisy places in order to have the hearing protection you need. With SoundGear, you have both. The SoundGear line of products includes the breakthrough instant fit in the ear (ITE) recreational and industrial models that feature replaceable sleeves in two sizes to fit most people right out of the box. SoundGear also includes conventional behind the ear (BTE) models with sound tubes terminated with a noise blocking foam tip as well as full custom in the ear (ITE) models. Both BTE and ITE models are available in two technology levels; Silver and Platinum. 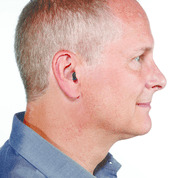 If you are faced with the need to hear better in a noisy place, as well as the need to protect your hearing at the same time, you need to consider SoundGear by Starkey Hearing Technologies.